Arun works closely with The Clay Company on various special projects. 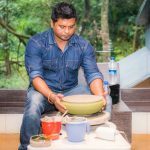 An accomplished ceramist, and a generous teacher, Arun has been a mentor, guide and friend to The Clay Company since 2014. Arun has a Bachelor of Fine Art degree from Benaras Hindu University, 1992-96 in Pottery & Ceramics. Key Exhibitions:•“Mrittika -2” Group Exhibition at Bharat Bhavan, Bhopal 2014. Manisha was the Senior Artist on our panel and was associated with TCC since its inception playing a key role in all our events – American Embassy School, Pottery Barn and AVID Workshops. We will be forever grateful for her support, guidance and friendship! Miss you Manisha! 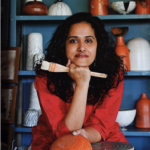 Manisha Bhattacharya has been working in the field of ceramics for over two decades. She currently works out of her sky-view terrace-studio in Delhi. She has also been a Visiting Faculty at the Delhi College of Art. Manisha, a Fulbrite scholar, has received training from the New York State College of Ceramics, Alfred University [2003- 2004]. The Charles Wallace India Trust Award in 2001 took her to the School of Art& Design, Univ. of Cardiff. In 1992, she went to study under Jane Hamlyn in Leeds, U.K. on an Inlaks Grant. Manisha was awarded the Senior Fellowship [2006- 08] and the Junior Fellowship [1997- 99] by the Ministry of Culture, Govt. of India. She learnt pottery from Deborah Smith & Ray Meekar at Golden Bridge Pottery in Pondicherry [1989- 90], Nirmala Patwardhan at Garhi [1984- 85] and Mansimran Singh at Delhi Blue Pottery and has participated in various exhibitions and workshops in India and abroad. Ever so knowledgeable about clay, Dutta ji was a studio assistant who truly loved clay. It was his life because he chose it to be his life. He enjoyed working with it and made it his business to understand as much as he possibly could about it. And he shared his knowledge, understanding, contacts, and learnings generously! A stickler for making students clean their own wheels in the proper way, we first met Dutta ji when he was the studio assistant at the Delhi Blue studio at Safdarjung. It was a friendship that lasted many years and existed beyond clay to discussions on Communism and Marxism, and all sorts of economic and political models and ideologies – what works what doesn’t, what will work and what definitely wont! Ever willing to help, and one of the most hard working people ever, may he rest in peace wherever he is.